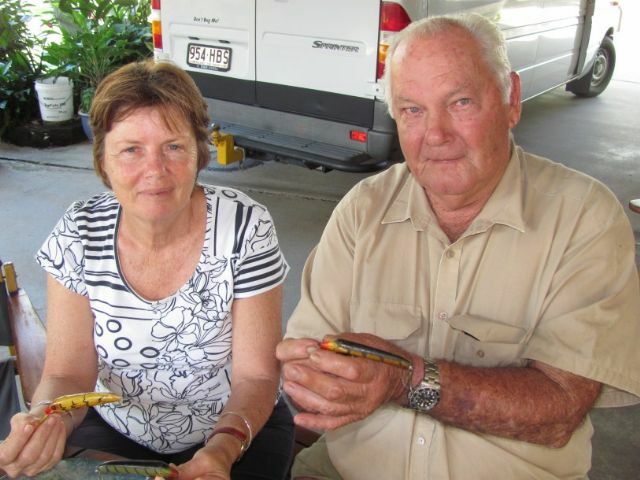 Bob and Kathleen Radlof are the makers of "Barra Lure". Bob is 71 now and grew up in the Cairns area fishing for Barra's right up into the Cape. He also saw the need to make a lure for the tropics as all that was available at the time was hard to get and expensive. Bob knew Eric Moller and decided to make his lures similar but not identical. The construction and materials has Eric's influence for sure. Here is a pic of Bob and Kathleen with a couple of their lures. Bob did all the cutting and carving and Kathleen done the signature,gluing of the eyes and bib as well as the painting. 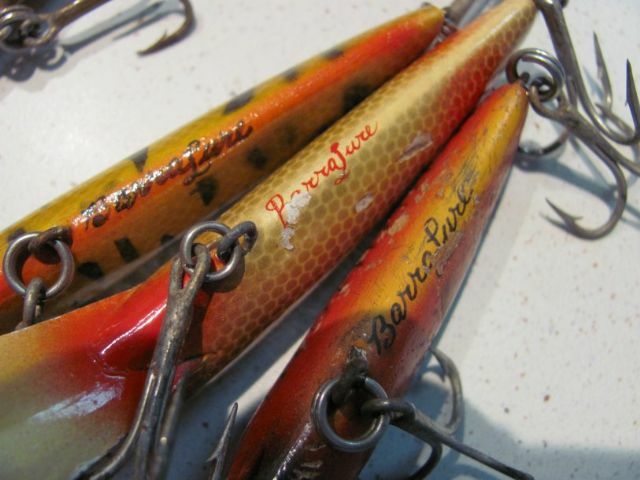 Bob made his first lures for sale in the early seventies and stopped selling in 1981.All his lures went to Purcells sports store (where Ron Gallo worked with Harold Purcell)and what was left over went to Fong On Sports in Atherton.Family and friends also managed to get enough to fish with. The process of making them went as follows. White Beech from fence posts was the timber used. Bob would take it to his mate at the sawmill and get it dressed down to the size he required before the whittling took place.Roughly 25mm by 20mm by tthe length of the lure he was making. Basically he made a 3",4" and 5" minnow pattern. From there Bob would put a few pencil lines on the small block of wood and carve it with a pocketknife till it was all but done.Then he would use a different blade on it's side and scrape the lure to a smooth finish.After that a little hand sanding was all that was required to have a lure ready for drilling and painting. The holes were drilled with an electric drill and the bib slot was cut with a hacksaw.All this was done by eye. Bibs were made from Zinc Anneal and hand cut with Tin Snips.A sheetmetal shop cut long strips of the Zinc at the correct width for Bob and he went from there.The concave in the bib was done with a half piece of waterpipe pressed onto a hole piece of pipe onto the bib.Very simple but effective. The wire eyelets were made of heavy gal wire and bent round a nail to form a splitpin.As with Eric no twisting was performed.Bob said he never once saw a wire pull from his lures.This was due to the hole size he used as well as the angle and the good epoxy.Bob then checked all the alignments before painting. 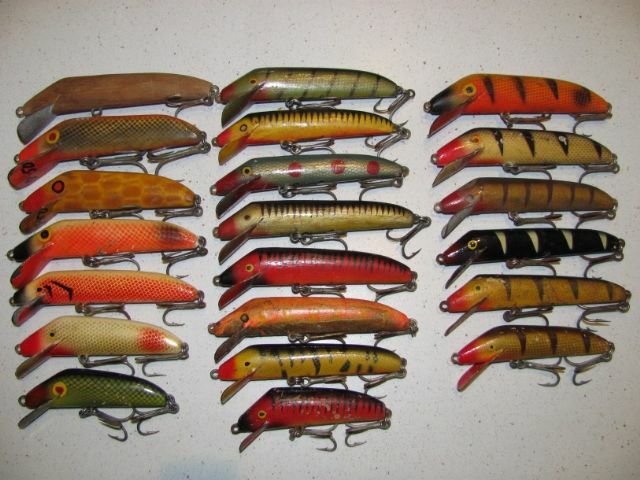 Kathleen handpainted a few lures but most were done with an airbrush. The eyes were put on using the head of different nails dipped in paint. The signature was done by Kathleen with a proper nibbed pen dipped in paint. When finished and hooked up Bob water tested every lureI quizzed Bob as to the time to carve a lure and he said he had it pretty much down pat.5 Minutes to carve from the little block and all up 45 minutes from start of carving to the finished product.Drying time of paint obviously a consideration. Here are a few Barra Lures. No doubt there are a few of these lures scattered around the country.The head shape and heavy gal eyelets are a telltale sign of Bob and Kathleen's lures.Some of the early ones did not have a signature. Barry - Once again an excellent read, a huge thank you to yourself, Bob, and Kathleen for taking the time to put this together for us. It sounds like Bob had an excellent relationship with his suppliers, what a smart way to work, and must have saved a huge amount of time, which you'd need when they are all hand carved with a pocket knife I imagine. i am starting to become a fan of your bio threads Barry. This is our Country's History you are recording and its fantastic to read and see the people who pioneered the art of lure making. The hardware on those lures looks second to none and i must say the penmanship by Kathleen is just wonderfull. Another good bio Barry, keep em coming mate well done.. ....Pete. Another great bio Barry, well done to you for taking the time not just to track down the makers but to get the photos and information then put it into a very interesting and well put together read. thanks again Barry, love your work, you obviously love doing this, and I love reading it. I read this article out to the family at grandads wake last week. Will be getting this framed along with my personal collection of barra lures. celebration of a life well lived.